If you are planning on buying a trampoline for use in your back yard, you're not alone. Nowadays, more and more American families are discovering the benefits of having a trampoline for home use. 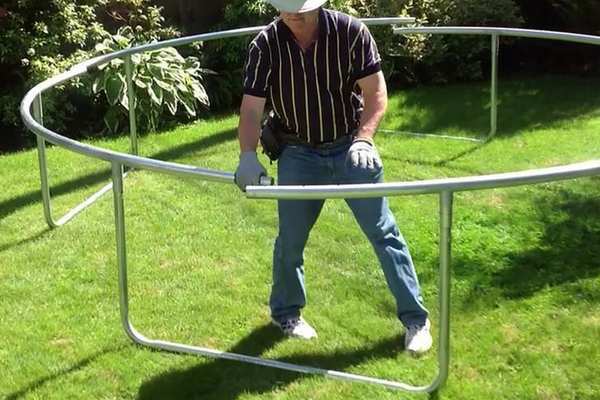 However, almost all models of home trampoline require some assemble, and it's important to understand how much trampoline assembly time is required before you buy. So how long does it take to set up a trampoline? Read on for our handy guide. ﻿﻿How long does it take to assemble a 10ft trampoline﻿﻿? How long does it take to put a 14 foot trampoline together? How long does it take to put together a Skywalker trampoline? How long does it take to assemble a Springfree trampoline? How long does it take to set up a Vuly trampoline? How long does it take to disassemble a trampoline? How long does it take to assemble a 10ft trampoline? Trampoline assembly time largely depends on the make and model you buy. Some trampolines are easier to assemble than others and you should check out what reviewers say about the assembly time of your particular model. As a rule, setting up a 10ft trampoline will usually take at least an hour, and could take upwards of 3 hours if you are setting up alone. So, you can see that setting up a trampoline needs a bit of a time commitment. However, a lot of this will be taken up with attaching the springs. So, to make this quicker, it's worth investing in a trampoline spring tool. Some trampolines come with this included, so although these tools are inexpensive it's worth checking if one is already in with your trampoline. This makes the job less fiddly and can dramatically reduce the assembly time needed. Again, this often comes down to your trampoline model, as some are much more easy to assemble than others. As they contain the same components, assembling a 14ft trampoline shouldn't take too much longer than a smaller trampoline of the same type. However, you should expect it to take a little longer. This is because a 14ft trampoline will need more springs, and these can be time-consuming to fit. Therefore, it's an excellent idea to get hold of a trampoline spring puller to cut down on assembly time and make attaching the springs safer and more stress-free. 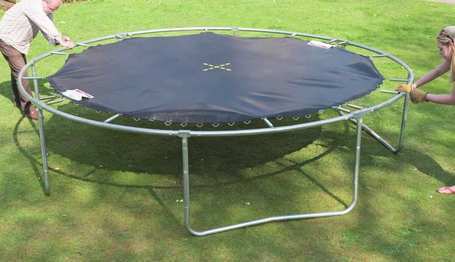 Skywalker are a popular brand of trampoline. If you're considering this brand, you may be wondering how long it will take to assemble. This partly depends on which model of Skywalker trampoline you purchase, as there are a variety of sizes and styles available. However, the general consensus is that Skywalker trampoline assembly is pretty easy and takes around 2-3 hours. They include a useful manual to help with the process. You could cut down on this by roping in someone to help you and using a spring attaching tool. 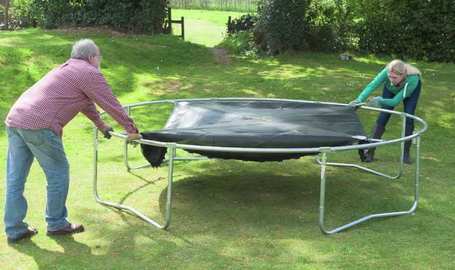 Springfree trampolines take longer to assemble, with some users reporting that it can take upwards of 4 hours. These trampolines come with a very detailed and helpful manual. However, Springfree trampolines are pretty tricky to assemble. If you can afford to, you may feel it's well worth hiring in a trampoline assembly service to put up your trampoline for you. Alternatively, it's probably a good idea to get together some friends to help you with the process. Although we found it hard to find customer reviews that focused on assembly, Vuly trampoline set-up shouldn't take too long. This is because the frames are specially designed to be easy to put together, as they use a limited number of components. They also include an assembly manual that is clear and easy to follow. Therefore, putting together your Vuly trampoline shouldn't take more than a couple of hours. A trampoline assembly service will assemble your trampoline carefully according to the instruction manual and have the necessary expertise to do the job as quickly and safely as possible. Furthermore, they have access to specialist assembly equipment which you may not have handy in your home. The process can usually be completed in less than 4 hours, although this could be longer if your trampoline is particularly large or complex to put together. 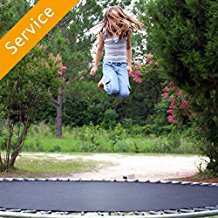 Amazon Home services provide a trampoline assembly service if you live in the US. Generally you can expect to pay around $130 dollars for the assembly of your trampoline. However, you may need to pay extra if you have a trampoline that is especially time-consuming to construct. Also, there are other independent trampoline assembly companies that offer trampoline assembly services. It may be worth checking online to see if there is one operating in your area code. Just like assembling your trampoline, this varies according to your make and model. Generally, it shouldn't take more than a couple of hours to disassemble a trampoline. Having your manual handy will also make this process simpler, and many include special instructions for taking your trampoline apart as well as for putting it together. A trampoline spring tool is just as useful for disassembly as it is for putting your trampoline together in the first place. Because removing springs with pliers can be extra fiddly, using a special tool can really cut down on time spent taking apart your trampoline. Getting help with this process can also cut down on the time it takes. Hopefully, you now know the answer to that age-old question: how long does it take to set up a trampoline? As you can see, trampoline assembly time largely comes down to the make and model of trampoline that you purchase. As we have mentioned, we highly recommend investing in a trampoline spring tool to make assembly much quicker and easier. Also, remember that you can always hire in a trampoline assembly service if you don't have time to do the job yourself. Happy bouncing!